An act of vigilante justice was captured on video this week, as a Calgary man tracked down a thief that stole his company's $15,000 trailer, called it in to police and recorded the whole thing on his dashcam. Robert Michaud owns a construction company in the city and said he's had his company's property stolen about six times in the past few years and neighbouring companies have been targeted as well. Usually it's copper or batteries, but on Jan. 6, he was hit with another theft, watching the culprits on surveillance video breaking the lock and hooking up his trailer before leaving with it. "That trailer was slated to be used on a job the next day, so yeah, we just wanted our equipment back," he said. "The police said they were going to try and find the person. But we just found them before they did." A few days after the theft, one of his brothers spotted the stolen trailer on the highway. Michaud was in the area and caught up to it and verified that, indeed, it was his stolen property — but the logos had been painted over. "Then I got on the line with the RCMP in High River to say I'm following my stolen trailer. There's really no place to turn off at that point." 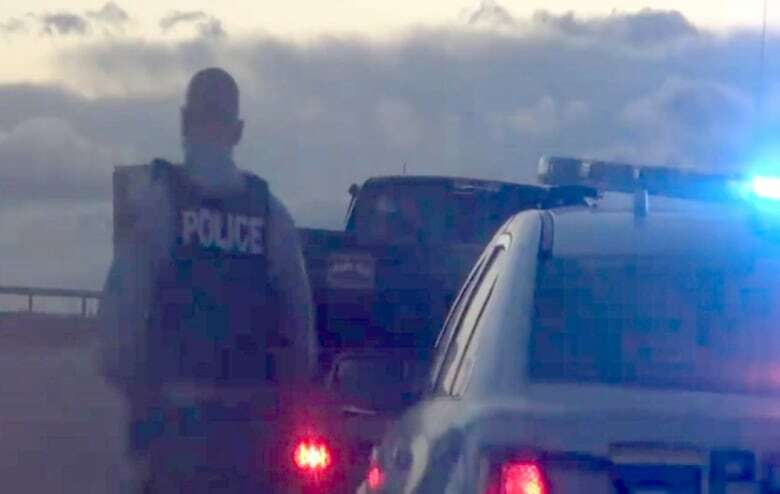 In the video, recorded on Michaud's dashcam, RCMP cars waiting on the side of the road flick on their lights before pulling the truck towing the stolen trailer over. He said he never had any intention of confronting the thief, but after spending so much money and time dealing with theft, it felt vindicating to get his property back himself. "[I was] ecstatic … I never get to see or hear what happens to these people or how they were caught, so it was nice to see it happen first-hand," he said. Calgary police confirmed that on Wednesday, the day Michaud's video was shot, they took one person into custody and charged them with possession of stolen property. A police spokesperson also said they generally wouldn't encourage following along as an arrest is made, as police don't know who they're dealing with and they don't want the public to put themselves at risk.